Since the turn of the century, the world has seen a lot of research and development in the alternate energy sector. Prominent in the league of alternate and renewable energy sources are biofuels. Biofuels are used in automobiles, aviation, industrial machinery and agricultural equipment. Climate consciousness and constantly increasing prices of petrol and diesel have led to biofuels making inroads in the automotive fuel industry. Automotive biofuels can be classified in two major classes – ethanol-based biofuels that can be used in spark ignition (petrol) engines and bio-diesel that is suitable for compression ignition (diesel) engines. Derived from edible and non-edible sources, agricultural waste and other biomasses, these fuels are comparatively less polluting and are renewable. In 2016, the global market for the production and wholesale pricing of ethanol and biodiesel was pegged at close to US$ 101 billion (Rs 714,989 crore). By 2023, the market is expected to grow to almost $133 billion (Rs 941,919 crore). In 2016, the United States was ranked as the largest biofuel-producing country, followed by Brazil and Germany. Internationally, biofuels have been in the spotlight for almost two decades but have only recently gained serious traction in India. The Indian government has been actively working in developing an ecosystem of production and manufacturing biofuels in India by structuring and upgrading existing policies. India’s national policy on biofuels focuses on the vision, goals, framework, policies and guidelines for production and usage of biofuels in India. The policy looked at a minimum level of biofuels become readily available in the market to meet the demand at any given time, with an indicative target of 20 percent blending of biofuels, both for bio-diesel and bio-ethanol by 2017. Though this target was not achieved in 2017, the state made new additions and amendments to the policy in May 2018, setting guidelines on the production of ethanol and adding drop-in fuels for usage as bio-automotive fuels. What is a drop-in fuel? A drop-in fuel is a type of biofuel that can be blended with fossil fuels in any proportions or can be used independently without any engine modifications. Though the Indian biofuel market is still at a nascent stage, there is an indigenous company working in championing biofuel for diesel engines in India. 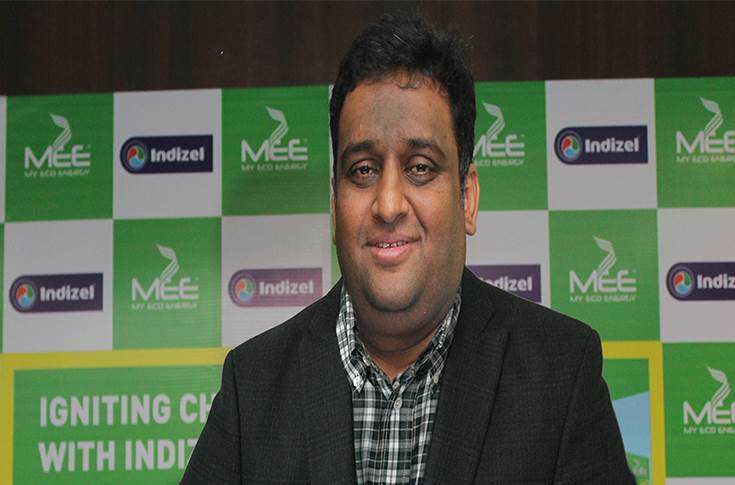 My Eco Energy, a seven-year-old Mumbai-based company has developed a drop-in biofuel for diesel engines called Indizel. With diesel being the highest consumed fuel in India, My Eco Energy has chosen to strive to work on developing a drop-in fuel for diesel vehicles. Indizel is an automotive diesel made from non-fossil sources and is produced at My Eco Energy’s manufacturing units in Gujarat and Maharashtra. It is a premium quality fuel that meets the automotive diesel fuel standards of BIS:1460 (Indian) and EN590:2013 (European), which are also the recommended standards by all automotive manufacturers for usage of fuel in their vehicles. It is the first ever biofuel that matches and surpasses petroleum diesel quality specifications, making an ideal fit for all diesel engines. It also matches the emission standards of Euro 6 and BS VI, making it India’s first Euro 6-compliant fuel. Made from renewable sources, Indizel has a high cetane number as well as lubricity value, which improve the combustion rate, fuel efficiency and the overall performance of the vehicle. It helps improve mileage, achieve a faster ignition, reduce noise and maintenance cost. Indizel also has higher flash point and is safe compared to traditional diesel. It also records the lowest level of sulphur, NOx, particulate matter and hydrocarbons as compared to conventional diesel. Usage of Indizel will decrease the tailpipe emissions of the vehicle by more than 80 percent. Indizel outperforms traditional and additive-based premium diesel in quality, economy, performance and emissions. MEE’s Indizel is a game-changer in the world of automotive fuels. The advent of this drop-in fuel could lower India’s dependency on fossil fuel and bring down the oil import bill. It will give a better choice to customers and end monopoly of traditional diesel. Indizel is the cleanest and most efficient fuel for diesel engines and most of the regular users record an increase of 15-20 percent in mileage. Currently retailed through 7 My Eco Energy fuel stations in Gujarat, Maharashtra and Andhra Pradesh, the company plans to operate over 700 fuel stations across India by 2020. This retail network would be the first large fuelling network in India solely dedicated to renewable automotive fuel. The company is working on building a robust distribution channel and aims to be present across India especially on national and state highways. Powered by state-of-the-art technology, My Eco Energy is bringing to India the most advanced fueling system. All its fuel stations are fully digitised that guarantee complete assurance of quality and quantity, are cashless and also offer self-service. My Eco Energy has studied and created a robust fueling mechanism that requires minimal human intervention. The result is a seamless fueling experience completely controlled by the user. The MEE Wallet App allows users to control the fuel quantity, pay online and track their bills. Each MEE fuel station will be ISO certified, and offers an assurance of best product quality and service. Another major benefit associated with Indizel is that it comes under the purview of GST. Users of Indizel are eligible for a 12 percent GST set off for registered GST users. With conducive policies in place and quality manufacturers pioneering biofuel infrastructure in India, there are still doubts about whether such fuels would gain acceptance in the market. Importantly, manufacturers of these fuels will have to educate the public at large about the benefits of biofuels and develop this market. A product like Indizel reduces pollution drastically and increases the efficiency of the vehicle. It reduces the maintenance cost, leads to fewer breakdowns and saves manhours. It matches EN 590 and BIS 1460 standards, so all the engine guarantees are taken care of. It matches the most stringent emission norms of Euro 6 and BS VI. Being a drop-in fuel, there is no need for engine modification. MEE believes that the inhibition of users will gradually reduce over a period and they will start opting for a much cleaner and efficient fuel like Indizel. Currently, the company is focusing on automotive fuels for diesel engines but in future it would also invest in developing biofuel for petrol vehicles. India is slowly but firmly moving towards a biofuel revolution. With companies developing products like Indizel, investing in developing a retail channel and the government taking concrete actions to support the biofuel ecosystem, all the signs look rather positive.